Cochrane's large DNA model was centre-stage recently at Germany's leading digitization event, CEBIT. Hewlett Packard used the model as part of its stand on its efforts to lend supercomputing muscle to the fight against degenerative disease. Our DNA model is no stranger to the limelight. It's been featured everywhere from university lecture halls to leading trade shows, where it is used to demonstrate the makeup of DNA. It shows the double helix and chemistry of 12 nitrogenous bases, sugar and phosphate groups, bringing this fascinating science to life. 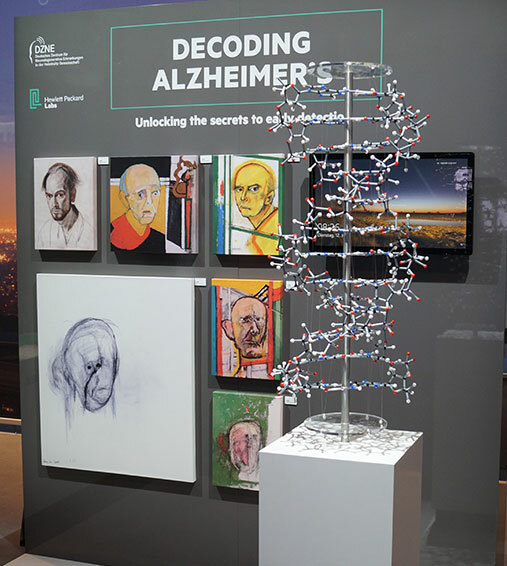 Hewlett Packard has partnered with the German Center for Neurogenerative Diseases (DZNE) to speed up research around neurogenerative diseases such as Alzheimer's, Parkinson's and Lou Gehrig's disease. ArtLabStudios found our model was the perfect way to add visual interest to this important topic. Thanks to Theres Laux from ArtLab Studios for permission to use this image, taken by photographer Johannes Kritzler. See our DNA model for yourself!